Surveillance video captured the moment a man flashed a 12-year-old girl near a Houston school. HOUSTON, Texas (KTRK) -- A 12-year-old girl has identified the man she said exposed himself to her last week. Manuel Rodriguez Jr., 36, appeared in court on Wednesday morning. He is charged with felony indecency-child exposure. Because Rodriguez has not yet hired a lawyer, his case has been reset. The court has ordered that he not have contact with the victim or any other children under 17 years of age. Houston police responded to a report of public lewdness last Wednesday afternoon. 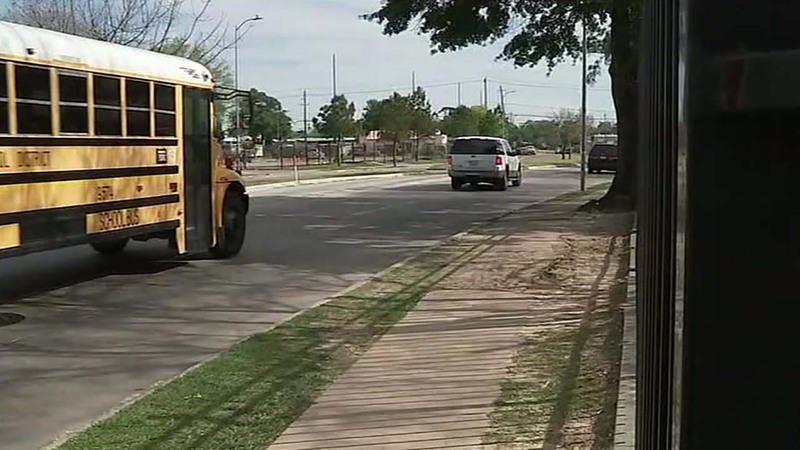 The 12-year-old girl said she was walking on the sidewalk across from Sam Houston High School when a man in a silver Honda pulled up next to her. A mother is doing everything she can to warn others about a man who allegedly exposed himself to her daughter near a school. According to police, the passenger side window was open and he was exposed from the waist down and touching himself. After the girl screamed and called 911, the man sped off. "It's not right for a grown ... man to do that to a child. It's not right," Vanessa Flores, the girl's mother, told Eyewitness News after the incident. Flores said police told her they had similar reports. She notified all the schools in the area and contacted ABC13 to get the word out.